Tuesday – Burger, Brats and Dogs Night, $1 off Veggie burgers! 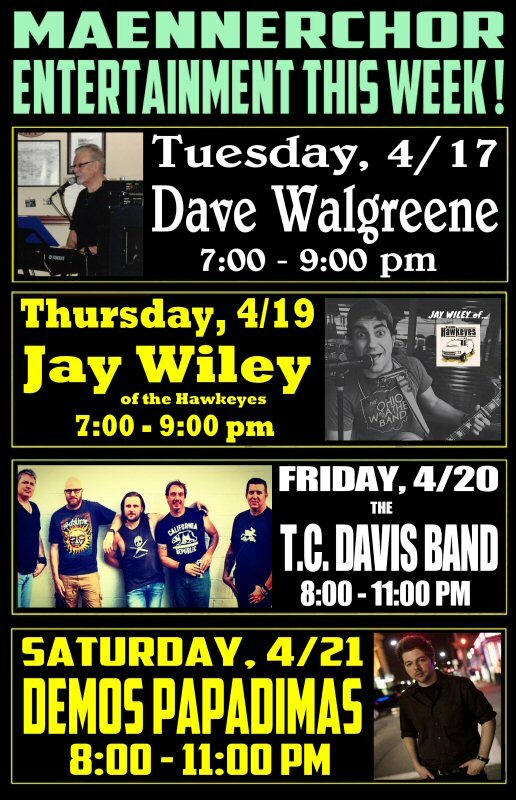 From one of Pittsburgh’s premier rock bands, the Hawkeyes, comes Jay Wiley! Jay performs a variety of original and cover tunes! Returning to the Club is the T.C. Davis Band. Hailing from Castlewood PA, T.C. Davis plays a variety of original Rock/Americana and a few covers. They can be heard this Friday morning at 9:15 and 9:45 on the WDVE (102.5) Morning Show from Pittsburgh promoting songs from their new LP! If you don’t receive WDVE on your radio, you can log into iheartmedia.com to stream it! Returning to the Club is Demos Papadimas kicking off a stunning weekend of great live entertainment! Demos skillfully intertwines American roots music with Mediterranean influences. Based in Northeast Ohio, Papadimas and his band consisting of Ralph Rich (drums), Dave Lynn (electric guitar), Corey Gray (Upright Bass), and Caitlin Hedge (violin) have received considerable attention and created a dedicated following largely through live performances at many of the region’s best venues, and can now be heard getting regular airplay on The Summit (WKTL). Our draft beer selections are always changing. On tap are Old Rasputin Russian Imperial Stout, Blue Moon, Brooklyn Winter Lager, Brooklyn Chocolate Stout, Evil Genius Adulting IPA, Left Hand Well Played Red IPA, Ommegang Lovely Dark and Deep Oatmeal Stout, Dogfish Head Sea Quench Gose, Spaten Original, Kostritzer Schwarzbier, Weihenstephaner hefeweizen, and Hofbrau Original!